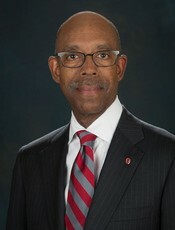 Dr. Michael V. Drake became the 15th president of The Ohio State University on June 30, 2014, following three decades of service as a higher education leader with the University of California. During his tenure, the Irvine campus rose significantly on many fronts. The number of applicants for undergraduate admission increased by more than 90 percent, including a more than five-fold increase in international applicants. The university’s four-year and six-year graduation rates increased by more than 15 percent, and ranked among the top 10 public research universities nationally. In his last five years at UC Irvine, the number of undergraduate students from underrepresented minorities increased by nearly 60 percent. Additionally, in 2014, more than 60 percent of the entering freshmen were first-generation students, and more than 40 percent came from lower-income families; both percentages were among the highest in the nation, and evidence of Dr. Drake’s steadfast commitment to diversity and inclusion. As chancellor, Dr. Drake played crucial roles in advancing the institution’s academic breadth and reach. In 2006, he oversaw the creation of the first new public law school in California in more than 40 years. In 2012, the UC Irvine School of Education was established under his leadership. Dr. Drake also helped launch new programs in public health, pharmaceutical sciences and nursing science. During his tenure, UC Irvine added more than 5 million square feet of new space, including the 500,000-square-foot UC Irvine Douglas Hospital and the 275,000-square-foot Student Center. The institution also embraced a set of values – respect, intellectual curiosity, integrity, commitment, empathy, appreciation and fun – as set forth by Dr. Drake, and incorporated them as essential parts of the UC Irvine experience. Prior to Dr. Drake’s arrival at UC Irvine, he served for five years as vice president for health affairs for the University of California system, overseeing academic program policy at the system’s 15 health sciences schools, located on seven campuses. He directed the special research programs in tobacco, breast cancer and HIV/AIDS; co-chaired the California/Mexico Health Initiative; launched the PRIME (PRogram In Medical Education) initiative to train physicians to care for underserved populations statewide; and founded the California Health Benefits Review Program. Before that, he spent more than two decades on the faculty of the UC San Francisco School of Medicine, ultimately becoming the Steven P. Shearing Professor of Ophthalmology and senior associate dean. He has served as an administrative leader, teacher and physician-scientist, conducting clinical research on glaucoma and maintaining an active surgical practice. He has written scores of scholarly articles and chapters, and his fifth textbook was published in 2009. Dr. Drake is an alumnus of Stanford University (BA) and UC San Francisco (MD), and holds two honorary degrees. He is an elected member of both the Institute of Medicine (National Academies) and the American Academy of Arts and Sciences. He has received numerous honors and awards for teaching, public service and research, including the Burbridge Award for Public Service, the Asbury Award (clinical science) and the Michael J. Hogan Award (laboratory science). In 2014, he became the 27th person to be awarded the University of California Presidential Medal, in recognition of exemplary service to the university. Dr. Drake has served as trustee and national president of the Alpha Omega Alpha Honor Medical Society and as chair of the board of trustees of the Association of Academic Health Centers. He currently serves on the executive committee and the Division I board of the National Collegiate Athletic Association, and on the board and membership committees of the Association of American Universities. A New York City native, Dr. Drake has always maintained a fondness for Ohio, as his mother grew up and graduated from high school in Youngstown. Now, he and his wife, Brenda, live in Columbus. They have two grown sons and two grandchildren.